The Warm Buddy Polar Bear is a cute soft bear, a symbol of Canada. Every Warm Buddy bear comes with a removable inner heat pack that can be warmed in the microwave or cooled in the freezer. The Polar Bears’ warm-up feature promotes relaxation and provides natural relief from aches, pains, stress, headaches, tummy aches and ear aches. It’s gentle warmth helps settle children at bedtime so they can achieve a good nights sleep. Polar bear is 18″ long. The heat pack comes unscented. Add aromatherapy oils for added enjoyment. 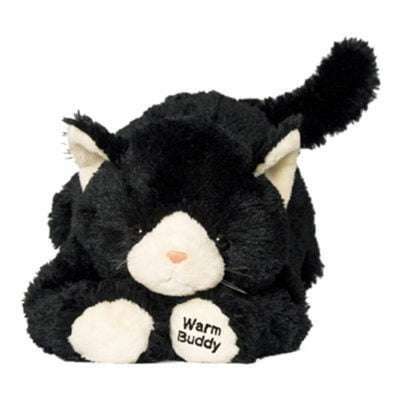 Warm Buddy heat packs have been made in Canada since 1996. 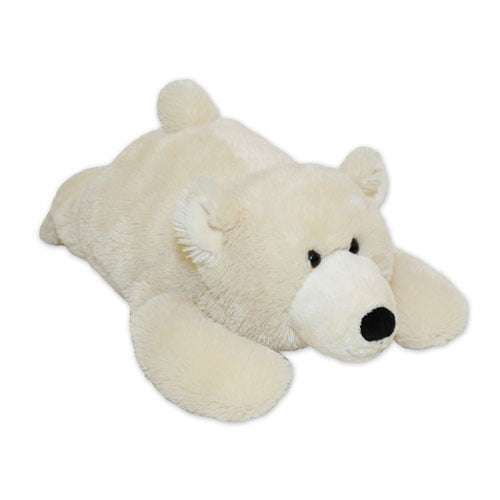 The Warm Buddy Polar Bear has been tested extensively and is sold as a class 1 Medical Device. A portion of the proceeds from the sale of this Polar Bear go to help all bears in need! This cute bear is worth more than five stars. If you think he’s adorable in the picture, he’s twice as adorable sitting with you and a terrific new addition to the Warm Buddy line. Instant love when I opened the package that arrived today as a 47th birthday present. Bought this for my girlfriend. She regularly needs a warm pack, once a month. She’s not really one for stuffed animals (we’re mid-twenties), but she absolutely loves this guy. She was very happy and said it was a very “thoughtful” gift. I thank a good friend, Justina, for the referral. He’s a bit bigger then I thought when I ordered him, but his shape and size are perfect to lay across her abdomen. He’s very soft, and he doesn’t get in the way when we’re watching movies or reading in bed. It took us a minute to find where the warm pack was. I’ll save you the trouble and tell you that there is velcro on it’s side that leads to the pocket… not anywhere else, like his mouth. The reason I’m giving it 4 stars instead of five, the only reason, is because I was expecting a larger warm pack. This one is about 15×15 cm. It works well and keeps warm for a long time. Given the price and the size of the bear, I expected something larger. Good news is that the pocket in the bear is large; it would probably fit a much bigger warm pack if the time comes for an upgrade. All-in-all I would recommend this to anybody… everybody. The polar bear is soft and cuddly, and big enough for a ten year old. Haven’t tried to heat the rice pack. It’s a Christmas present.